Outer space as a black pit with an avante-garde concentration on claustrophobia, dissension and debasement. Famed female French director Claire Denis has made her first English language film with an inordinately high budget (for her) with High Life, and to me, this cerebral science fiction is the strongest reaction I’ve had yet for a film by her. I’m stirred, dizzy, disoriented, challenged by it, mystified to the point of playing detective with it (this sci-fi qualifies for people who have seen “Solaris” or “The Man Who Fell to Earth”). Robert Pattinson and Juliette Binoche put forth no vanity performances that are inward and lonesome but that are so obstinately non-showy, so committed to low-key realistic minimalism, that they are excellent. Heaps of patience are required for all performances and lots of little action that often takes place. For payoff, there are two gorgeously imagined encounters with black holes in space, and for psych students, there are kinks and compulsions within the passengers worth deconstructing. Mostly we recognize the meticulously boxy design of the spacecraft they travel on infinitely adding to the feeling of being holed up. This is not an ordinary science fiction film. It is rebellious to the language of narrative storytelling, opting to not only show the film as flashback, but to supply it in elliptical fashion, underlining the backgrounds of its characters with one line of muttered dialogue (get it the first time or you miss it), a time slide construct that goes backwards or forwards or jumps ahead leaving you unsure how much time has been spent. If there was ever a film that succeeded in creating a sense of human entropy, of channeling you into dissociation and mental fogginess, this is it. As for the passengers, it is crucial to mention they are death row inmates that signed up to travel as guinea pigs through the galaxy. Their fulfillment obligation is to record a daily log or suffer the consequences, and so the logs are delivered half-heartedly by Pattinson or Binoche, or whomever. It is not loudly stated as to why earthly governments want them to try this, however it is insinuated that they will be psychologically studied, that attempts to create test tube babies in outer space will be made, and perhaps one or two inmates will attempt to fly a buoy ship into the black hole. We know that one test tube baby worked, because Pattinson turns out to be a parent of a girl. This is laid out in the first scenes of the film. He stares at his baby with the kind of love you expect from any parent wondering how their child will grow, with no forced added for effect emotion. He feeds the baby. He attempts to put the baby to sleep when he’s tired and wants his baby to go lights out so he can attend to other needs on the ship. He wants his baby to learn how to walk on two feet as soon as possible. These are wondrous moments for a parent, but pitiful for us. We worry if the baby is ever going to get off that ship and see land. We also know soon enough that there are flashback events that must explain everything. Such as, what happened to the rest of the passengers? The film goes back, and back more. Some flashbacks are on Earth, but we cannot tell if Pattinson’s character is being represented in any of them. My take, is that he is, that we don’t see him except but that we are seeing everything from his eye’s point of view. Why do we see only woodsy shots or shots of young ruffians on train tracks, and nothing special about his life or anyone else’s life? I feel it is because Pattinson, and others from his working class ranks, don’t have anything special from their lives to share. That was as nice as things ever got for Pattinson, or for anyone else around him. A life of no particularly outstanding highlights. Then we get more scenes of these inmates on the ship. Binoche is a genius doctor and scientist who might, or might not, be the only passenger who was not incarcerated. If she was a volunteer on the mission, didn’t she fear that she would be raped by these angry outcasts? She’s not the only female on board, but she is attractive. Maybe she’s not sexual, and others sense her abhorrence to man and because of that they stay away. Or so I thought. An extended sequence comes of Binoche’s masturbation that involves an apparatus that was supplied on the ship that is as ungodly as it is tantalizing. Much of Binoche’s inner drives are held back from explanation, and we learn more, but little by little. Every trait, every condition, in every character, is slow-burn realization in the way Denis parcels out details. 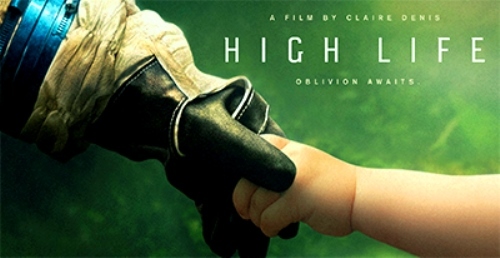 I am lucky to have seen “High Life” on the big screen where I was committed to it. I don’t know if I would have liked the film as much if I saw it on the small screen. It’s a film that has to be watched carefully, with hardly a blink at all, because minute behavioral shifts can happen in an instant. The eyes analyze every aspect of the frame on the big screen. Such attention to detail can be lost if you were watching “High Life” on a small screen. It’s a pitiful sentence to be on the space ship for an indefinite amount of time. A late sequence shows what happened to a pack of dogs that must have been studied on a spaceship – they grow senseless and hostile too, just like people. Pattinson, more than any other character, seems built to outlast menial routines with fortitude. He loves his child, and that seems to be enough. But is it? How stout can one person be? How scrupulous can one person be after years of letting a spaceship imprison his own mind? Two characters at the end take a trip into nothingness like there’s nothing to it. A man believes he is performing a task for God, and in return, he dreams that his girl will be a beautiful one, with lipstick on, an idealized woman, waiting to be coveted. Also with Andre Benjamin, Mia Goth, Jessie Ross and others. Film Cousins: “Silent Running” (1971); “Solaris” (1972, Russia); “Sunshine” (2007); “Interstellar” (2014).